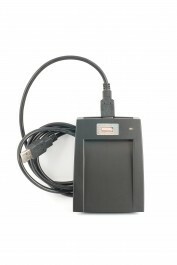 CR10E is a Proximity Card Reader that makes easily the registration of cards and avoid manual input mistake. Never need to input card number by hand when issuing card to access control system but only present the card to this reader. Plug USB wire into PC USB Port, the other port connect ReaderCommunicationPort.